Just got the new Webroot update today, it seems quite nice. I have one problem though, when I try to access WR with the community button, the read now button, or any button that opens communication with WR I have to be in my administrator's acct. I can't access WR while in my standard account. It's quite rare if I am ever using my admin. acct. I'd like to see the new version of WR able to access 'home' without having to use an administrator account. I've just tested this on Win7 Pro 64 in a standard user account, and it's working for me. It makes me wonder if maybe you do not have a default browser selected in that account. Please check your browser's settings screen to see if Windows recognizes it as a default browser. Otherwise Windows will not know where to send the command to open a browser. In Chrome, click the three horizontal lines, go to Settings, and check to see what "Default Browser" says towards the bottom of the screen. Please let us know if selecting a default browser helps your situation. I did check and my default browse is IE 10 in both my standard and administrator accounts. I rarely use it, but it is my default browser as some of my programs prefer it for their updates and communicating with their sites. I use Chrome for all of my surfing the web and downloading most programs. Any of the buttons in WR that communicate with your site don't work in my standard acct, but work fine in my administrator acct. I am thinking a clean install of Webroot might be the answer, what do you think? If I do, should I use the uninstall included with WR or a more thourough uninstall with Revo UI? If you think that I should do a reinstall please list the link of your program on the site. Yes try a clean reinstall. Uninstall reboot and install the latest version here and make sure you have a copy of your keycode before doing so and as you know do this in your Admin account! And please let us know the out come. In my admin. acct did an ui with just the WR uninstaller re-booted, re-installed which didn't work. Tried again this time using revo ui to uninstall, re-booted, and re-installed in my admin acct, this didn't work. The third time I unistalled with Revo in my admin acct., re-booted, and installed it with my standard account, this worked. It seems to be working fine now, took installing in my standard acct to get it to work right. Curious what else you were going to suggest? I could have suggested a step that would have isolated whether or not the issue was on your computer or in the cloud. The link works using a redirecting url, and what we could have done was seen whether or not the redirect was malformed or malfunctioning in some way. But hey, I'm happy the un/re worked! Does it work correctly in your Admin account now also? I don't use LUA's so this is interesting and I'm sure Jim will find out if it's reproducible if others come up with the same issue. Yes, the buttons for contacting the WR site works in both my admin. and std. accts. The only thing that doesn't seem to work in my std acct. is when I right click on the WR shortcut and try to open it as administrator, nothing happens, it won't open. It is something I usually don't do, but I was testing to see if it would. If I do the right click, open as admin in the admin. acct., WR opens noormally. TH, what does LUA mean or stand for? I spoke to soon. It seems since doing the right click in my std acct , trying to open as administrator, I can no longer reach WR by clicking the buttons. It seems to have reverted back to the way it was. LUA - Limited User Account or standard account but not Admin. I have seen it and was waiting for a reply from Jim on this as you might need to Submit a Support Ticket if he doesn't have anything else to suggest. I don't understand what you're trying to do. Why would you right-click the desktop icon and open as an administrator? You installed it with administrative privileges already. There isn't anything useful about opening it as an administrator. In my standard account I can open all of my programs as administrator by right clicking. Some I have to, Piriforms Speccy, Recuva, Revo Uninstaller, Secunia all have to be run as administrator. Some I've been running for years as administrator, Malwarebytes, SuperAntispyware. CCleaner I run as both administrator and std user to do thorough cleaning of my internet cache, etc. because it finds things to be deleted in both accounts. All my other numerous programs can be opened by right clicking and running as administrator and function the same either as std or admin. It saves me from having to log onto my administrator account. Every other program I have can be opened as either adminstrator or standard user account and work. I didn't have this problem with the old version of Webroot, I could open it as admin of std user and have full functionallity of the program. You already have that functionality with WSA because it runs at the system level. Please open Task Manager and click the button or checkbox for "Show processes from all users." You'll see WRSA running twice - once at the user level and once at the system level. That's normal function regardless of which kind of user account you're in. There is no need to tell Windows to open it as an administrator. I tried it anyway just to see if the issue reproduces for me, but it doesn't reproduce. You might have some irregular permissions on your system, but again, you don't have to open it as an administrator since it's already running as one. 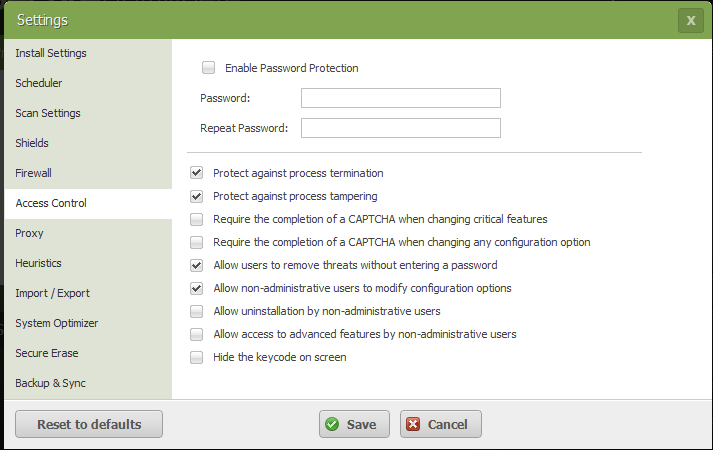 To get webroot to be able to use the buttons in my std acct. to 'phone home' I did another uninstall in my admin. acct. reinstall in my std acct. It worked fine, I was able to use the buttons to contact the forum, customer support, etc. As soon as I rebooted my computer they stopped working. I did not right click and run as administrator, and have tried rebooting, and the 'buttons' still don't work. I also noticed that some of the options in WR have to be run as administrator. Since I can't right click and run as administrator, it's kind of a pain to have to log into my admin acct. I am not running any odd settings in my standard account, it is set at MS's default settings. All my software is updated and current according to Secunia. As of now it seems the only way I can access WR's phone home feature in my std. acct. is to do a reinstall, and that only lasts till the next reboot. It still works in my administrator acct. even after the reboot. The AV and protection modes are all working fine. I think it would be useful to get logs in this case and possibly perform a remote session to get a closer look. At this point, I would encourage you to put in a support ticket. I'm going to be out the next two days and unable to field it personally, but if you could please include a link to this topic in your case, it should bring the support agent up to speed on what we've discussed so far. I wish I could reproduce the issue, but it's not happening on my Win7-64 test system, which tells me there is something unique going on that we'll want to identify. I'm sorry I can't be of more assistance on this one myself, but support should be able to assist further. I'm wondering if any of the settings in the screenshot would fix this Like, Allow access to advanced features by non-admin users. Thanks Jim and Th, I will start a support ticket as per your suggestion. Thanks Gorg I'd tried that and it didn't help. Again thanks to all for the help. I have seen this problem on Windows 8, I found the solution is to open Internet Options, click on the Security tab, click Trusted Sites and then add https://community.webroot.com to the site list. You should then be able to click on the GUI links and IE will open them. It solved my problem using standard accounts on Windows 8 64bit. One caveat, IE must already be opened when you try to open a link in the GUI. If IE is closed it will not work. Thanks Reldel, I tried your solution but it didn't work. The fix, called support and they did a remote fix. My only complaint is that I started a support ticket, yet it took WR a couple of days for them to respond and tell me to call support. Once I contacted support and they remotely accessed my computer it took the tech just a few minutes to find and fix the problem. Thanks WR.